Is this Egyptian-themed haven for online gamers worth joining? We certainly sphinx so! UP TO £850 WELCOME PACKAGENew Customer Offer. T&Cs Apply. 18+. Please Gamble Responsibly. If you are interested in playing a unique site, why not try out Egyptian themed casino at Pyramids Fortune. Egyptian theme stands out from the crowd, putting a fresh and fun spin on your favourite games and offering a range of special exclusive games. Live chat feature provides excellent customer support as well as a variety of contact options. Instant play mode makes it easy to get going on your mobile. They’ve done an excellent job of giving you great value with our Pyramids Fortune bonus codes and an incredible welcome package. The money-saving offers may well be what draw customers in from the more established sites, but the Egyptian theme stands out from the crowd even more so. The layout manages to be scattered with fun motifs and quirky slots, while remaining easy to navigate and view on your computer screen (or that of a smaller device). We definitely recommend you try out some of the addictive range of exclusives and their casino favourites reinvented with a twist. Their extensive collection can definitely offer something different or unique to suit the varied tastes of the online player community. Getting bonuses just for joining is certainly an impressive deal and its spread over your first three deposits, instead of just the first. So you can familiarise yourself with the site and its games before you’ve used up all your new player bonuses, meaning you enjoy spending them more. 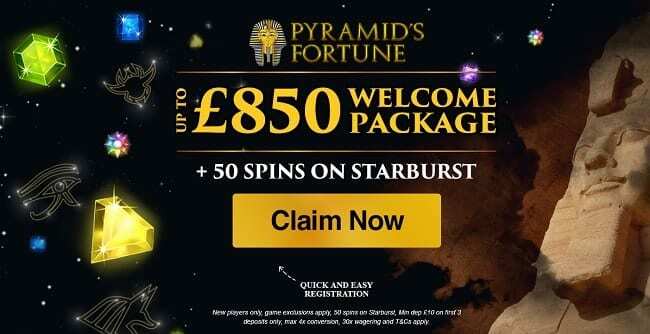 You may not find a Pyramids Fortune Casino no deposit scheme, but if you meet the minimum deposit of £10 then you can also get additional promotions. These can only be used on Starburst mind you, but since that’s a favourite with so many players it’s not really something to complain about. There’s also currently a bonus spins bonanza on Butterfly Staxx and up to 50 spins going on Wild Wild West – so you keep on playing and those freebies keep on coming! It’s also worth keeping an eye on their win boost Wednesdays deal or any competitions going, but what you’d really want is to become a VIP Club member. Loyal customers are duly rewarded with an invite to this club, giving them special privileges including cashback offers, weekly bonuses and more. Overall, this site makes sure their customers feel appreciated and has plenty of opportunities to get more for less. If slots are your thing, then so is this site. There’s entertainment aplenty in the large selection of games and some are exclusive so you won’t find them elsewhere. There’s a fairly good choice of typical table games like Blackjack and Roulette, but the focus seems to be on giving the classics a fresh twist with fun features. You can also enjoy live play, getting that immersive experience of a real casino, socialising with other like-minded players and live dealers. You may well prefer to go for the fantastical and imaginative themed games though, as this is where they excel. The Egyptian theme makes this site unique and in the best way, as you’ll seem to be in a whole new world and travel in time with these escapist adventures. Games such as Cleopatra Plus, Ramesses Riches and Pyramid Quest for Immortality are worth checking out. They’ll also guide your choices by informing you which games became favourites with your fellow players so it’s easy to make exciting new discoveries. You can also view new games separately or just explore jackpots or those on the Egyptian theme – there’s always a tab to suit your preferences. This site may not be for someone after a traditional and plain online casino, but it’s certainly going to be a hit if you’re after something out of the ordinary. If you wanted something that gave you the basics in a classic format, this isn’t it but it may still be worth exploring to see if you prefer the variations after all. Hopefully the further detail offered in our Pyramids Fortune Casino review can help you decide! It’s powered by Nektan Ltd, a well-known and established provider on the online gaming scene. Based in Gibraltar with a license there and in the UK, you can expect security and reliability from this company. Nektan can also offer some exclusive games, so you’re likely to find a particular favourite that has you coming back for more. They are also supplied by a few others such as NextGen, NetEnt and Aristocrat, ensuring they get the better pick of what’s out there. The live chat feature will also come in handy if you have any software issues or safety concerns, giving you opportunity to talk it through in real time with customer support staff. There’s also a telephone number, contact and comprehensive frequently asked questions page, all to be found on the site. Considering they’re not a major site, they’ve gone the extra mile to prove they don’t fall short in the customer service department. You may also be relieved to hear that it’s not actually in hieroglyphics, but all quite clearly laid out in an easy-to-use manner. Colourful games and the Egyptian motifs could have resulted in a chaotic aesthetic, but it’s carefully balanced with muted shades of blue and neat arrangements. You’ll find it no trouble to focus on gameplay and navigate the menus, while also appreciating the fun features this way. They operate the usually favoured methods of payment including Skrill, Neteller and Paysafe. Pyramids Fortune casino card payments can also be made (credit or debit) with MasterCard, Maestro and Visa. If using your phone then you will be limited to using Boku (which sets you up to pay via your mobile phone bill and therefore won’t require banking information), but since many find this the most convenient method for mobile gaming then it’s more of a benefit than a hassle. More options like PayPal wouldn’t go amiss, but overall there’s a satisfactory choice. Licensed by the UK Gambling Commission, you can feel safe trusting them with your money, whether you’re rich as the Pharaohs or just trying to get close. On occasion the withdrawals can take longer than you might expect though (usually pending time is set at around 72 hours), so be prepared for that possibility. You also cannot use Boku or PaySafe for withdrawals, so make sure there’s an option you feel comfortable with otherwise you will be unsure how to access any winnings. iPhone, tablet or android device players may not immediately realise, but Pyramids Fortune is a fully mobile compatible casino site and the layout is in fact designed with them in mind. Even if you’re not used to using smaller devices, you may find yourself leaning towards it in order to carry on playing when a winning streak gets going but you have to get out and about. The instant play mode is handy as you can log in and get straight to playing in your web browser. Players that resent downloading extra software and clogging up their phone will appreciate this. There isn’t a download option available, so bear than in mind if your priority is being able to play when you’re without a connection. If you’re happy with the fact that it’s slots focused and strays from tradition, then you’re on to a winner with this Pyramids Fortune. The world of Egyptian escapism brings you games that you would never otherwise discover and there’s certain to be a few you love. The selection is quite impressive and reinvents the casino basics as well as offering a variety of colourful slots and a chance to win enough riches to impress the Pharaohs. There is room for improvement when it comes to payment options and withdrawal times so make sure you’re happy so accept this before signing up. It would also be nice to see a download option so you can play on your mobile at all times, but it loads quickly in the browser therefore an app isn’t a necessity to boost the quality of play.